There are multiple programs running in the background that are performing various operations in your computer and may be making some changes in your computer that you might want to keep track of. Some programs like antivirus or video streaming is running in the background. Some programs may even start to write on your disk. You can’t keep track of each change as the processes keep writing data to the disk every second. If you have a sensitive folder and you want to keep track of changes made in that specific folder then this article is for you. Just keep reading! Although there are many freeware programs to track changes in folders, we will discuss 5 of the best tools to monitor folder for changes in real-time. 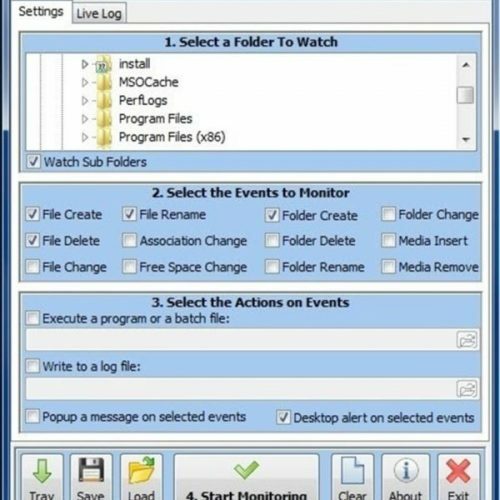 Watch 4 Folder can perform various actions for the folder that the program is watching. First select the folder and sub-Folders from the tree like directories to keep a track of it. Now it will notify you everything about the changes in the file. It notifies you if the folder is renamed, deleted, created etc or if any changes are made to the free memory. It is also watches if a device is inserted or removed (USB). The tool provides alert by a system alert or by simply a window that appears on the screen. It can also store the events that occur in a file. You can store it in an executable log file. You can also allow different files with different configuration settings. 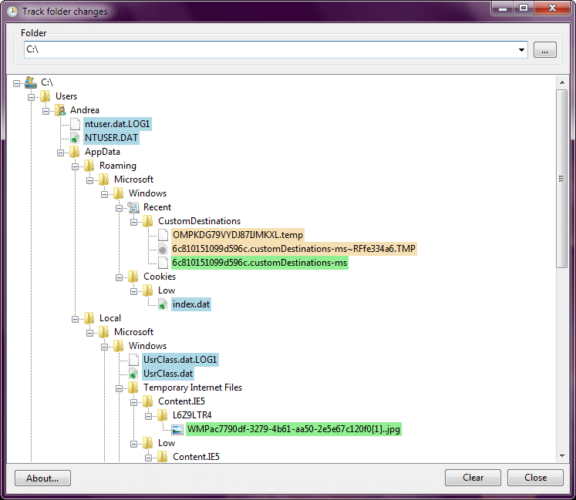 FolderChangesView is simple and active tool for monitoring folder activities. As the program starts you need to give the path of those folder and it’s sub folders, which you want to monitor. It asks you to enter the path rather than browse for the folder which can be a little confusing. It does not show any pop up alert when changes like deletion or insertion take place in a folder rather it shoes all the information in the tools main window with three columns, which tells about modification, creation and deletion of folder. It shows all the activities of a drive as well. For example if you select the root directory and all it’s sub folders, it shows the entire directory of root. Directory monitor is a tool that can watch file modification or changes made in that folder. It can handle multiple locations at once. You can even exclude the files from the monitoring process or include any other if you want. It provides various methods of alerting about the changes or modifications. It can simply create a log file of all the alerts or show a pop up window by sending a system call. It can also show the activities of network share as well as well as local folders. 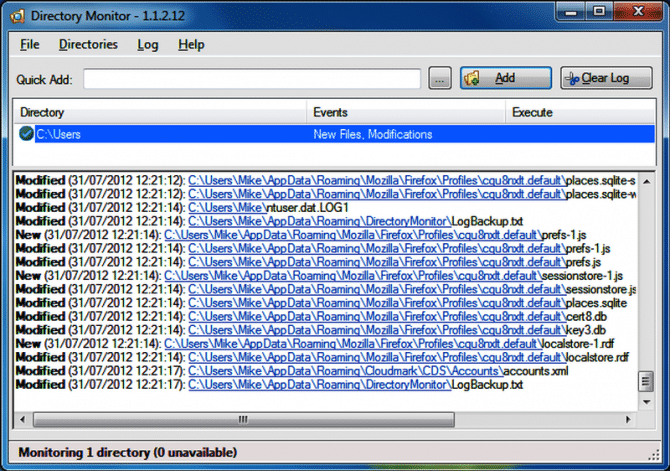 This is another tool for monitoring files creation, deletion or modification. This is a very small tool and is not heavy on your memory. It can select the file type of your choice that you want to monitor or restrict it to only one file type. It can further alert you about sub-folder modification. The most useful thing some users find about this tool is that it sends modification alerts on your email. If the user wants, it also has the ability to execute a particular program after the alert is triggered. Please note that TheFolderSpy has not been updated for a long time but it still works even in Windows 10. You can trigger different actions on specific changes to the files inside the folder being monitored. You can add individual files to be monitored in addition to the folders. This is a very cute little tool with a beautiful interface. It does not support as many alerts as another tools but it gives alerts regarding simple changes like creation, modification or deletion of folder or sub-folder. A complete tree directory is displayed if you select a directory or a folder that has various sub-folders. The Thing that make it a little different from others is that it shows the modification, deletion and creation of a particular folder in color codes which gives it a pretty interface and saves the user from any complexity. Green is newly created, blue is modified and orange is deleted, so if you simply rename a file you will get an orange and a green entry because the old was removed and a new created. I normally use different tools according to the situation. For example, if I want to investigate a network folder, I would use Directory Monitor and if I want a simpler portable solution, I would go with FolderChangesView. But my favorite remains TheFolderSpy which can do a ton of automation on specific changes to the file or folder. For some network environments, I have written scripts which would run and email me the changed file when it is changed. What is your favorite program to monitor file and folder changes in Windows?